As a result I have written the following open letter to the SEC. It offers technical answers to various questions posed to prospective Bitcoin fund managers. As part of the cryptocurrency community, I feel that it would be a positive development for everyone if a cryptocurrency ETF was created, and I also feel a powerful obligation to make sure it doesn’t get denied due to a simple lack of information. If you support Bitcoin and would like to help out, feel free to give me a signal boost by tweeting about it. Thank you. RE: Staff Letter: Engaging on Fund Innovation and Cryptocurrency-related Holdings. Thank you for your public invitation for responses to the Staff Letter. I am sending this email in support of crypto-friendly, well-thought-out, and non-draconian regulation regarding Fund Innovation and Cryptocurrency-related Holdings in the United States. I hold a master’s degree in Computer Science and write educational articles about cryptocurrency on my website https://rosecrypto.com — one could rightly say that I am an expert on the technical side of cryptocurrency, as well as the markets and culture growing around it. As an educator in this nascent field, I understand the need for a robust set of rules regarding cryptocurrency as it begins to enter into the world of traditional investing. The idea of a “Bitcoin ETF” has weighed especially heavily on the minds of cryptocurrency enthusiasts lately, in addition to weighing on the total crypto market cap. This is a big step and it needs to be done right. As such, I’d like to submit responses to some of the questions posed in your staff letter entitled “Staff Letter: Engaging on Fund Innovation and Cryptocurrency-related Holdings.” I am obviously not the manager of any prospective cryptocurrency fund, but nonetheless I believe that helping to inform you on this matter is in everyone’s best interest. Mutual funds and ETFs must value their assets on each business day in order to strike a net asset value (“NAV”). Appropriate valuation is important because, among other things, it determines fund performance, what investors pay for mutual funds and what authorized participants pay for ETFs (and what they receive when they redeem or sell). Would funds have the information necessary to adequately value cryptocurrencies or cryptocurrency-related products, given their volatility, the fragmentation and general lack of regulation of underlying cryptocurrency markets, and the nascent state and current trading volume in the cryptocurrency futures markets? 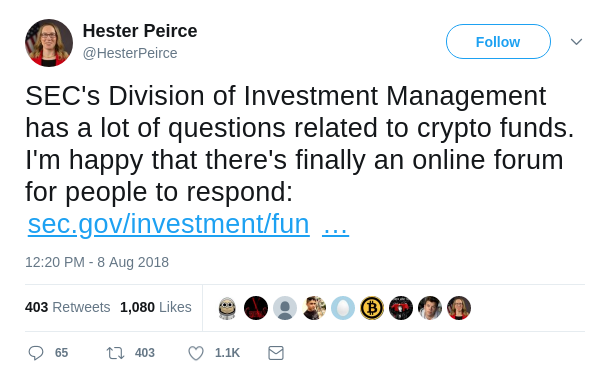 The short answer is “yes, easily.” I have personally written computer programs that can identify — down to the minute — the average price across all major exchanges for a particular cryptocurrency. My own motivation was so that I could properly file my taxes; I’m certain that the fund managers can pay one of my fellow computer scientists six figures to do the same thing on a larger scale. How would funds develop and implement policies and procedures to value, and in many cases “fair value,” cryptocurrency-related products? Again, cryptocurrency exchanges already exist, and one can use up-to-the-minute information supplied via their APIs to obtain an average pricing for a cryptocurrency. I don’t work on Wall Street, but this seems like a more than reasonable way to assign “fair value” as it’s quite literally what people around the world are paying at any given time. How would funds’ accounting and valuation policies address the information related to significant events relevant to cryptocurrencies? For example, how would they address when the blockchain for a cryptocurrency diverges into different paths (i.e., a “fork”), which could result in different cryptocurrencies with potentially different prices? How and when would funds recognize such information in their NAV? Firstly, I’d like to point out that it’s not really a question of “could” — forks will always result in different cryptocurrencies with different prices. I’m obviously not the manager of one of these funds but my suggestion is that there are many different ways this scenario could be handled — and the intended response to this scenario would of course be outlined in the ETF’s prospectus. The way that makes the most sense to me is that the fund manager could sell all of the “forked” coin off as soon as the fork happens and distribute the proceeds to investors as a special dividend. Alternately, the fund’s NAV could be raised by putting the proceeds of these sales towards more of the fund’s approved assets — in this case, Bitcoin. It bears mentioning that most forks are essentially worthless; just about anyone can create a fork of a cryptocurrency, and these forks are usually not taken seriously. A financially meaningful fork is not a common scenario, but it does happen. What policies would a fund implement to identify, and determine eligibility and acceptability for, newly created cryptocurrencies offered by promoters (e.g., an “air drop”)? How might a fund account for those holdings if the fund chooses to claim such cryptocurrencies? The answer to this question is largely the same as the previous. These coins or tokens could simply be claimed and then immediately sold off as markets for them become available, and the proceeds could be used as detailed above. It bears mentioning that “airdrops” by and large tend to be worthless or near-worthless, at least in the beginning, and robust markets/exchanges for them rarely exist. How would differences among various types of cryptocurrencies impact funds’ valuation and accounting policies? This is a short question with a potentially very long answer. Some clarification is needed: what “differences” are being referenced here? As I’ve mentioned above, it’s possible to get the average USD spot price across major exchanges of any cryptocurrency. It seems to me that technical differences — if that’s what is being referenced here — among disparate cryptocurrencies should not impact a fund’s ability to valuate anything. How would funds consider the impact of market information and any potential manipulation in the underlying cryptocurrency markets on the determination of the settlement price of cryptocurrency futures? The major cryptocurrency exchanges often supply more information than spot prices. Trading volume and other statistics could therefore be used to identify potential manipulation and valuate accordingly. A key feature of open-end funds, such as mutual funds and ETFs, is daily redeemability. Funds must maintain sufficiently liquid assets in order to provide daily redemptions. Under the new fund liquidity rule, rule 22e-4, funds will be required to implement a liquidity risk management program. Under the rule, among other things, funds must classify their investments into one of four liquidity categories and limit their investments in illiquid securities to 15% of the fund’s assets. A fund’s liquidity classifications should be informed by the market depth of its holdings (that is, whether trading varying portions of a position in a particular portfolio asset is reasonably expected to affect the liquidity characteristics of that investment) as well as other relevant market, trading and investment-specific considerations. What steps would funds investing in cryptocurrencies or cryptocurrency-related products take to assure that they would have sufficiently liquid assets to meet redemptions daily? How would funds classify the liquidity of cryptocurrency and cryptocurrency-related products for purposes of the new fund liquidity rule, rule 22e-4? For example, would any of these products be classified as other than illiquid under the rule? If so, why? How would funds take into account the trading history, price volatility and trading volume of cryptocurrency futures contracts, and would funds be able to conduct a meaningful market depth analysis in light of these factors? Similarly, given the fragmentation and volatility in the cryptocurrency markets, would funds need to assume an unusually sizable potential daily redemption amount in light of the potential for steep market declines in the value of underlying assets? How would a fund prepare for the possibility that funds investing in cryptocurrency-related futures could grow to represent a substantial portion of the cryptocurrency-related futures markets? How would such a development impact the fund’s portfolio management and liquidity analysis? With larger market-cap cryptocurrencies, market liquidity should be a non-issue. Of course, it’s not just cryptocurrency liquidity that’s being discussed here; instead, it seems that these questions have more to do with the liquidity of the assets backing the funds themselves. As I’ve stated, my expertise is in computer science. While I have a rough understanding of futures-backed ETFs, fractionally backed ETFs, and so on, this is well outside of my expertise. As such, I’ll withhold my thoughts on this matter and leave this to other public commentators to address. The 1940 Act imposes safeguards to ensure that registered funds maintain custody of their holdings. These safeguards include standards regarding who may act as a custodian and when funds must verify their holdings. To the extent a fund plans to hold cryptocurrency directly, how would it satisfy the custody requirements of the 1940 Act and relevant rules? We note, for example, that we are not aware of a custodian currently providing fund custodial services for cryptocurrencies. In addition, how would a fund intend to validate existence, exclusive ownership and software functionality of private cryptocurrency keys and other ownership records? To what extent would cybersecurity threats or the potential for hacks on digital wallets impact the safekeeping of fund assets under the 1940 Act? With regards to the 1940 Act, we’ve firmly exited the realm of my expertise. I will say this: trusted custodial services for cryptocurrencies do exist and could likely be adapted to serve the purposes of a fund while also following the specific details of the rule in question. An established company like Coinbase would likely be more than happy to adapt their existing custodial service to this purpose. With regards to validating various ownership records, etc., this is something that is essentially “built in” to Bitcoin and other cryptocurrencies and is known as “signing a message with one’s private key.” While this may sound complicated to a nontechnical person, it is actually one of the simplest and most straightforward things about cryptocurrency. In laymen’s terms, it’s possible for me to easily prove that I am the owner of a private key without revealing that private key to anyone. It is worth noting that “exclusive ownership” of a private key is not really provable under any circumstances; a private key amounts to a series of letters and numbers which could (but shouldn’t) be shared with any number of people. Finally, security is of paramount importance in cryptocurrency; as someone who maintains an educational website about these topics, crypto-security is always on my mind. The answers to most of these questions are highly technical and I won’t bore you with a lengthy treatise; the long story short is that, when proper practices (cold storage, etc.) are followed, it is not possible for a digital wallet to be hacked. So long as the funds’ managers hire the relevant experts and follow these security practices to the letter, there is no issue. It is worth mentioning that this is not a cryptocurrency-specific problem; any physically-backed fund could suffer from theft if the proper security procedures aren’t followed. It is too easy to think of these threats as somehow worse just because they are now “cyber.” I am not suggesting that this is not a serious concern, mind you — just that it is something that already has a well-defined, technical solution. While the currently available bitcoin futures contracts are cash settled, we understand that other derivatives related to cryptocurrencies may provide for physical settlement, and physically settled cryptocurrency futures contracts may be developed. To the extent a fund plans to hold cryptocurrency-related derivatives that are physically settled, under what circumstances could the fund have to hold cryptocurrency directly? If the fund may take delivery of cryptocurrencies in settlement, what plans would it have in place to provide for the custody of the cryptocurrency? This is, of course, a question directed more towards the actual managers of the funds. I would again reiterate that professional and trusted cryptocurrency custodial services, escrow services, etc., do exist and could be used for this purpose. ETFs obtain Commission orders that enable them to operate in a specialized structure that provides for both exchange trading of their shares throughout the day at market-based prices, and “creation unit” purchases and redemptions transacted at NAV by authorized participants. In order to promote fair treatment of investors, an ETF is required to have a market price that would not deviate materially from the ETF’s NAV. In light of the fragmentation, volatility and trading volume of the cryptocurrency marketplace, how would ETFs comply with this term of their orders? While volatility is certainly a ubiquitous factor in cryptocurrencies, it is not unique to cryptocurrencies. Many existing ETFs, for example, are extraordinarily volatile and/or based on volatile assets. To speak frankly, it is difficult for me to believe that rebalanced-daily 3x-leveraged ETFs can exist under the SEC’s rules, but the volatility of cryptocurrencies somehow creates an unworkable problem. Have funds engaged with market makers and authorized participants to understand the feasibility of the arbitrage for ETFs investing substantially in cryptocurrency and cryptocurrency-related products? How would volatility-based trading halts on a cryptocurrency futures market impact this arbitrage mechanism? How would the shutdown of a cryptocurrency exchange affect the market price or arbitrage mechanism? These are all good questions with lengthy answers, most of which are more suited to be answered by the prospective fund managers. With regards to a cryptocurrency exchange shutting down: one would simply recalculate average spot prices sans that exchange. In a recently issued statement, Chairman Jay Clayton noted that concerns have been raised that cryptocurrency markets, as they are currently operating, feature substantially less investor protection than traditional securities markets, with correspondingly greater opportunities for fraud and manipulation. The Commission has also discussed concerns relating to the risk of fraud and manipulation in cryptocurrency markets in orders denying exchange proposals to list the shares of commodity trusts that would hold cryptocurrency. In addition, a number of recent media reports have highlighted a range of possible vectors for potential manipulation of cryptocurrency markets. Although some funds may propose to hold cryptocurrency-related products, rather than cryptocurrencies, the pricing, volatility and resiliency of these derivative markets generally would be expected to be strongly influenced by the underlying markets. How have these concerns informed your responses to the foregoing questions concerning, for instance, valuation and liquidity? How would you weigh these concerns in considering whether offering a proposed fund is appropriate for the wide range of investors, including retail investors, who might invest in the fund? Would investors, including retail investors, have sufficient information to consider any cryptocurrency-related funds and to understand the risks? Have you discussed with any broker-dealers who may distribute the funds how they would analyze the suitability of offering the funds to retail investors in light of the risks discussed above? Are there particular challenges investment advisers would face in meeting their fiduciary obligations when investing in cryptocurrency-related funds on behalf of retail investors? These questions are again mainly directed towards prospective fund managers. I would note that retail investors already have the ability to expose themselves to the same sorts of risks that a cryptocurrency-related fund would expose them to. Indeed, right now they are able to do this in an almost completely unregulated fashion by simply buying some cryptocurrency directly. This is not some arcane thing that an average person cannot do — indeed, educational websites like mine make it very easy. As your Staff Letter notes, Chairman Jay Clayton spoke on these exact concerns. I’m not sure if the right conclusion has been drawn, however. A great deal of the potential for fraud in cryptocurrency comes at a personal level, with individuals losing coins due to bad security practices. Allowing retail investors to invest in Bitcoin or other cryptocurrencies through the lens of an ETF would completely eliminate this form of fraud for those investors. If investor protection is important to you, this is exactly how you implement it: you give retail investors a means by which they can avoid the technical (i.e., security-risk laden) aspects of investing in cryptocurrency. You give them a Bitcoin ETF. Bitcoin is complicated but undeniably important. I encourage the commission to learn as much as they can about it. Remember that cryptocurrencies are a brand-new asset which, if regulated properly, are likely to enrich our country and our markets in the long term. You are in a uniquely powerful position to make a choice that could help to put America at the forefront of one of the most crucial technological developments of the 21st century. I urge each and every one of you to make the right choice: take us into the future, SEC!